Once well known as the place to get cheap cameras and new models not available anywhere else, it’s been nearly a decade since Japan was the camera shoppers paradise it once was. The reason for this is two-fold. Fold number one is language. Specifically the menu navigation language option. Several years ago several well meaning *cough* *cough* moronic *cough* companies that will remained nameless *cough* Sony *cough* Panasonic *cough* started to distinguish cameras for domestic Japanese consumption and international consumer models. It didn’t make sense to make the differences based on function, so they did the only thing they could think of (with two oxygen deprived brain cells that’s not much). They made language specific models. Digital Still and Video cameras from Sony and Lumix can only show Japanese menus. Everyone else in the world gets all the other languages (and often Japanese to boot). For the record, Canon cameras are usually made to the same specifications globally including menus. Why all the nonsense? To keep the market in Japan safe from cheap imports (of cameras made by the same company in other countries). This takes us to fold two. It’s not cheaper. Seriously, not even close. Most cameras in Japan are now priced significantly higher than similar models in nearly every other market in the world. Sure, some of this has to do with currency exchange rates, but Japanese companies actually go out of their way to keep cheap cameras off the market. Sony for example does not release most of their lower end and less expensive cameras into the Japanese market until months after they are made available in the US, and sometimes not at all. And while cameras start out full price and slowly see reductions over time, pricing in Japan is much more rigid, keeping the release price months and sometimes years after a product hits the shelves. My suggestion to anyone who wants to buy a new camera for their pilgrimage to Japanese shrines is buy before you fly. So is there nothing left in Japan for the camera lover? Of course not. These are mostly abuses meant for low level and uneducated consumers, but Japan has a huge population of camera hobbyists, and they are well taken care of. For the DSLR or even film (yes, they still exist) photographer, there are lots of reason to be happy in Japan. While new camera equipment is just as pricey here as the cheap stuff, used equipment is both cheap and plentiful. Ask any Nikon fan in Tokyo where the scene is and you will soon be pointed to Fujiya Cameras in Nakano, well known for it’s wide stock of cheap used lenses. And for when price is no object, high end pro equipment that is rare and difficult to get in most parts of the world can be found on the shelves in your neighborhood Yodobashi Camera or Bic Camera. They may not be cheap, but for a pro photographer on a job, a replacement bulb for your lighting rig may be the difference between a good session or a costly reshoot. So if you are planning a purchase, or are just looking for a last minute Christmas gift (the writer btw, would love to get a Nikon D3s. Just sayin.) make sure to hit the internet and do a bit of research before you drop your cash. Here are a few links to get you started. If your Japanese is good enough or you have Japanese friends use http://www.kakaku.com if you want cheap. Of course it’s a little hit and miss if you need support depending on the retailer. I got a Panny GF1 for over $400 cheaper than the best Canadian price last March. I recently bought a Canon 7D and easily saved $300 from the best Canadian sale prices. So, there can be savings depending on the particular model you’re interested in. Rather nice site you’ve got here. Thanks for it. I like such themes and anything that is connected to them. I would like to read a bit more soon. There are many uneducated consumers (me included)of about everything. Are you an uneducated consumer? Many have just a little info and they think they have it nailed. John part of hemorrhoids treatment team. Regardless of a lack of English-language options, in Japan, no one should waste their money on sub-par Sony or Panasonic cameras. Of any type. Canon's DIGIC Image Processors are second to none in the point-and-shoot market, and if you're into DSLR's, like the OP says, a Nikon is a much better way to go. Can't imagine anybody going to Japan looking for cheap camera. Like they're Economy is only second's to the U.S.A. That's like going to Rodeo Drive in L.A. looking for cheap designer treads. If you want something cheap, go to Walmart. Thanks for this post. I was just thinking two days ago about hopping over to Japan to buy a camera, because the cameras here in Korea aren't as cheap as I'd like them to be. Hell! Whatever happened to the stereotype of going to Japan to buy your electronics for cheap? While camera equipment used to be a bargain in Japan the recent currency appreciation against the pound has meant that it's cheaper for me to buy some lenses in England now. One the whole though camera bodies are still cheaper than they are in the west despite recently currency fluctuations. The current migration towards hi-def video capable SLRs is particularly exciting. I'll wait for Canon's next generation of cameras before jumping in however. Nice post. I'm a Nikon fan myself. For me Japanese cameras can no longer rely on their tech image either and just presume that will cut it. Samsung have some really powerful models out there and are much better in getting them into the stores I shop at. One thing I like about shopping for cameras in Japan is that all the display stuff works. Many stores in the US have display models that are broken or for display purposes only. 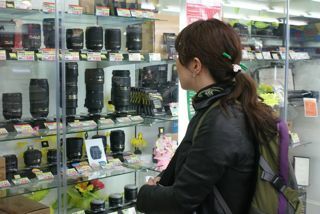 As you mentioned, Japan is also a great place for lens shopping. I often visit used shops to try out lenses before purchasing. I bought my 5D MarkII in Tokyo at Yodobashi and saved about $600 on what it cost back in Australia and that was even with the bad exchange rate. The US seems to have the best pricing on consumer electronics from what I see around the interwebs.